Setting God at the center ensures the creator is worshipped, not the created. Many make education a big priority in life. Some claim education spurs one to higher morality. God did not think so. In fact Adam and Eve proved God right. Satan tempted Eve with greater knowledge. She took the temptation. She gained more knowledge. You would be hard pressed to say she was more moral, she certainly did not glorify God with that knowledge. That does not mean we should shun education, knowledge and understanding. On the contrary, the right kind of education, knowledge and understanding certainly helps us glorify the Lord. This is the Holy Spirit’s’ point in John 7:14-17. The people of Jesus’ day revered the highly educated. Many wanted to enjoy higher levels of education. Most had a basic education, they learned basic reading and writing skills. The disciples are examples of normal individuals with a basic education. They had to keep records and tally their business totals. Moses was a highly educated man being given all the advantages of a prince of Egypt. Though Moses was educated, he had to under go 40 years of retraining with the Midianites. Consider that many people are educated on Christ’s death on the cross for our salvation. Most know just enough to think that everyone who says they are Christian is a Christian, even when no evidence of Christ exists in their life. Everyone who wants to know Christ needs to attend a Bible teaching and believing church. Only good biblical education is worthy education. Parents who claim Christ should never have their children in public schools. 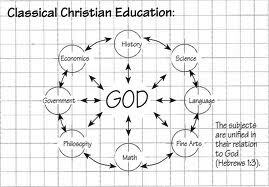 Those schools do not teach their children the things of God, they teach them the things of the world. Only the right education is good education. God the Father did not send God the Son to public (scribes/temple) education. Why should you? Jesus was homeschooled and spent time in the local synagogue reading God’s word. Church and home are the places of godly learning.